A few days ago, I went to an IMAX 3D showing of Avatar to see for myself if the movie is a “game-changer,” as many have suggested. And, it is, but in a way no one seems to be focusing on—the way it acknowledges and exploits photography’s power to shape both everyday and alternate realities. What struck me, as soon as the movie started, was how sophisticated the film’s technology was in creating three-dimensional photographic space. 3D movies been around for a while, but in older applications we’ve seen, you always knew what to expect, a handful of over-the-top moments when either surprising or predictable things—like weapons, body parts, or spurts of blood—would thrust out toward you. I still have flashbacks of the absurd moment in Wings of Courage (1995), the first IMAX 3D fiction film, when a gigantic hors d'oeuvres tray offered at a party, a looming and ridiculous tower of cheese cubes speared with toothpicks, triggered a wave of snickering throughout the audience. That 40-minute movie cost $20 million. The visual stakes in Avatar, which pushes three hours in length and its much discussed $460 million production and marketing budget, are, as one might hope, a lot higher. James Cameron’s follow-up to the overblown and enormously profitable Titanic (1997) is predictably spectacular, but it is the subtlety of Avatar’s photographically-based special effects that ultimately makes it startling in contrast with our mundane, everyday encounters with two-dimensional photographic images, both still and moving. While conventional movies have always invited us to get lost in the scale and look of images, when you’re watching Avatar through goggle-sized glasses, you realize that you’ve become embedded in it, that you’re not looking at it. For the first half hour, I was awe-struck, so excited and busy negotiating my way through a radically new photographic representation of space that I couldn’t pay much attention to the film’s narrative or performances (which turns out not be a problem, given how un-nuanced and cartoony those aspects of the movie are). In recent years, writers on photography have grappled with what they call the medium’s “indexicality,” and what images both mean and can do by archiving so much data about the “real” world. Avatar harnesses the “truth” we associate with a wealth of photographic detail and exploits it to levels we’ve not yet encountered. 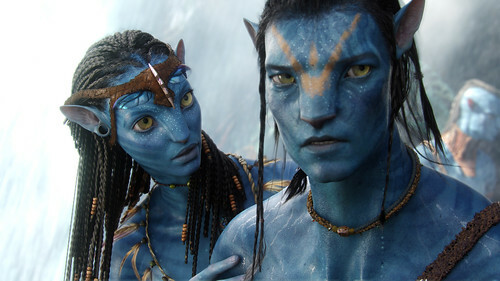 To create the computer-graphics-derived images of the blue-hued inhabitants of the far-away moon Pandora, for example, Avatar’s actors donned body suits studded with reference dots, and performed their scenes while up to 140 digital cameras registered every nuance of their movement and expression. Data from those images became the roadmap for the next stage of the animators’ work. With so many photo-derived and highly rendered details to take in, and such methodically layered illusions of depth to move through, watching Avatar becomes a novel and active viewing experience. You feel as if you’re in a fully-articulated virtual world, instead of just look at photographs of one. The experience is exponentially more intense, continuous, and demanding than looking at antique 19th century stereopticon photos, the View-Master slides of my childhood, or even the 3D photographs that, for reasons I’ve yet to fully fathom, were made to document my brother’s bar-mitzvah in 1954. Those seem quaint, by comparison, as do even more recent 3D entertainments. The earthlings in Avatar are delivered to another planet by advanced technology, and viewers, too, are transported to a previously unimaginable visual experience and space. Early 3D, like the classic Vincent Price vehicle, House of Wax represented a world that’s divided into three spatial planes, where everything appears either in close up, in the mid-distance, or far, far away. Avatar creates a much more seductive and zone-less photographic fantasy, which makes it simultaneously overwhelming and thrilling, when it comes to imagery. On other levels, there’s plenty to criticize. The film has been attacked by numerous constituencies for numerous reasons; it’s been called racist and colonialist. The Vatican has branded it as pagan. Cameron’s been accused of glamorizing smoking and plagiarizing central plot elements from a Russian sci-fi book series, Disney animated films, and comic books. In spite of all this supposed influence, input, and the movie’s technical achievements, the film’s story and values feel flat-footed and familiar. Avatar does get pretty boring after a while. But, if you think about the power of photography and are curious about state-of-the-art visual imaging, go see it in the biggest theater and in the priciest delivery format you can afford, to celebrate how photography keeps taking us to places we could never image without it.